I'm not a great cook...I leave most of that to my husband, but I love that this has ideas for decor also! Nice post. Sounds like a very happy holiday is about to happen in your home. Enjoy! Thanksgiving? I thought that was already past. I was in Walgreens yesterday and they are all decked out for Christmas and playing not stop Christmas music. JennyM isn't 1485 enough followers already? Is there a prize at the end of some rainbow I haven't heard about yet? And finally your welcome it was my pleasure to serve while you were in diapers. We used to go to mom and dads for thanksgiving. There was no discussion. It was just what you did. Since mom has been ill we have rotated it around to my sisters and I. It's a great time. It is a tad overwhelming when they hand over the Thanksgiving meal to you. I can taste the Hash Brown cassarole and turkey sauce already. Favorite recipe? Emeril has a pie recipe that's a twist on the classic pecan, I think it's called Kentucky bourbon chocolate pecan pie. It's delish. You must try. Throw me in the hat for this drawing. I'm a fowllower! What a great giveaway! I host Christmas dinner and always cook the turkey for Thanksgiving, even though we celebrate it at my sister's house. My one tip of all tips is to brine the turkey. It is superior to any other turkey you will eat. Alton Brown's recipe works like a charm. My one other piece of advice... don't try too many new & improved recipes. I've been there, done that. You will spend literally all day cooking and it isn't always appreciated. Maybe just introduce one or two variations and keep the rest of the menu traditional. Good luck. Thanksgiving is my favorite holiday, mostly because I love the four day weekend. Love this giveaway! Oh I love WS Thanksgiving recipes!! I used their turkey brine two years ago, actually, and it was ah-mazing. I "liked" you on FB, and follow your twitter! I liked the Facebook page!! I too am having Thanksgiving at my home this year. My family demands the traditional feast, but I am hoping to make it more modern as well! Combine 1 cup granulated sugar, 1 cup water, 2 tbsp whole cloves, and 3 cinnamon sticks in a saucepan. Boil, then simmer for 10-12 minutes. Cool, then strain, discarding the cloves and cinnamon sticks. Mix syrup with 2 quarts cranberry juice, 1 46-oz can pineapple juice, 1/2 cup fresh lemon juice, and 2 quarts ginger ale. I really don't know where the recipe came from, so I can't take credit. It's the most amazing punch ever, it SO tastes like fall, but in a very good way. I did edit it once for a christmas party, replacing some of the cranberry juice with red wine, some of the ginger ale with a dry champagne, and adding in nearly a whole bottle of cranberry vodka. The cinnamon/clove syrup you make is so strong that you can get away with putting a lot of things in. It hardly tasted like alcohol and really got the job done, haha. And I do like you on FB also. And bless you for your shout out to our Vets. You are the do-it-all woman and you never cease to amaze me! My mom still hosts Thanksgiving---and it's one of my favorite holidays. The day itself is great, leading up to it is great, and the follow-up of Christmas is amazing. The moment I read 'Willimas-Sonoma' I smiled. I love Thanksgiving with all my heart. At our house it is truly a big deal. My parents invite all those that don't have a place to go. It is a special day for many. And the food...oh the food! Glorious! Here are some rolls that I have not yet cooked but have had. YUM. I wish I had a recipe to share, but I am a public follower! Mmm...chipotle mashed potatoes sound wonderful! My favorite Thankgiving dishes are homemade cranberries with fresh cranberries, orange juice and sugar. And I make pumpkin pies with vanilla ice cream baked in as part of the ingredients. I wish I could be at your house for Thanksgiving. I want to see MiniMac sing with his new microphone stand. PS: I am good at duets. And I want to hear him say Simmmmma Down now to his Uncle. I am not a blogger but I already like you on FB. Thanksgiving and Christmas are when I become domesticated. Like a feral cat. I make a deelish cranberry sauce with cinnamon sticks and orange peel, the best apple pie you've ever tasted and fry up a mean turkey. Granted, I have no recipes of my own, but Better Homes and Gardens gave me an apple pie that makes my sister in law call me, "Can you make two pies this year? I really like having it for breakfast," and the internet make my inlaws fight over the white turkey meat. So, in short... hand over that book, sister! I am now following you on Twitter and liking you on FB. Did I say you stink? Just messin. I also am having a hard time getting into the spirit of the holidays. Thanksgiving is my favorite! More than Christmas even. I always have a pre-Thanksgiving Wednesday potluck party with about forty friends and it is FAB! We all dress up and I feel very Vogue-y. Even if I'm broke as hell. Since we have a very large family in town (40 plus for dinner) we always do a potluck with the grandparents in charge of the turkey. My new favourite recipes from this year were roasted carrots covered with a whiskey maple glaze and bourbon mashed potatoes. Have a great time with your family over the holidays. You had me at Williams and Sonoma. And Thanksgiving? Food and gratitude, surrounded by family and friends? What's not to like! ...Oh, yeah. I forgot. The crazy relatives who have been drinking since noon...My bad. Ooh I'd like that book! I LOVE Willams-Sonoma! My mom makes a great stewed cranberry and kumquat sauce - it's so easy to make! Just add a little sugar and stew away! And it has like one billion percent of your vitamin C for the day! Sounds like a good time will be had by all. I love to make spicy cranberry sauce. Will have to look it up and send to you tomorrow or over the weekend. 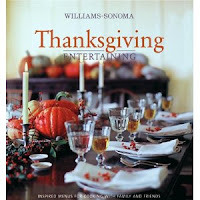 I forgot two things: I am a public follower and Williams-Sonoma is only one word! Cookbook sounds great! I follow with GFC. I follow you on twitter. I'm @scbrown929. However, I'm so excited for you and your first THANKSGIVING, that is going to be such a nice time. I would LOVE to add that cookbook to my collection! I also followed you on twitter! Butternut squash soup is one of my favorite fall things to make. Mmm! Thanksgiving is my FAVORITE holiday - after Halloween. Both of those holidays give me a great excuse to eat all the carbs I want. I've never tried this recipe, but may do so this year. I won't bother grilling the beans though. Just blanch them the day before and prepare the vinagrette and chill in a container. Bring the beans out of the fridge on T-Day and let them come to room temp. Heat up the vinagrette in the microwave and drizzle over the beans. Whatever you can do ahead of time will help! I follow you! I have never cooked thanksgiving, this is my first year! make the room complete. background music creates a great ambiance. play some cool jazz if you like them, or christmas music if you hate them. be sure to light candles, as you are now an adult and can play with fire. Do You Think You're Much better Off Today Than You Were 2 Yrs Ago?